So how do you cook the perfect steak? 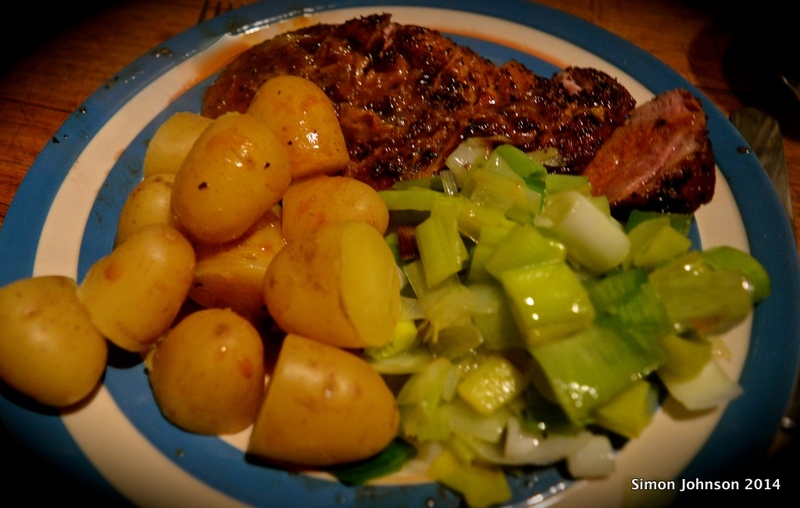 I’ve cooked a few in my time (steaks that is…not necessarily perfect ones!) but thought I’d go back to school this week and see what advice top cooks have to give. As ever cooks talk a good game. They give the impression that if you were as good as them the recipe will turn out perfectly. If you look more closely there is a tendency among recipe writers to obscure their recipes in either mystery or ignorance (either their own or their reader’s). So I’ve gone one stage further and dusted off my white lab coat to find out what scientists have to add to the debate. To begin with the mystery and/or ignorance. There is something of a debate as to whether Nigella Lawson is a chef or not. She herself claims to be an ordinary family cook. You can take either claim with a pinch of Pink Himalayan Salt. She’s written many best selling recipe books. We have one on our shelf and from it we get the following words of specialist wisdom on the subject of cooking steak. Well there you go. What more could you possibly need to know? No need to mention what type of fry pan or griddle you should use when Le Creuset comes as standard. No mention of heat. A grammatical error (or, perhaps, deliberate fashionable usage); the word ‘so’ used adjectively if not adverbially and a double entendre. And not a hint of useful advice. This isn’t intended to condemn Nigella. I like Nigella but what she is selling in her cookbooks and her television programmes isn’t an understanding of food but an enviable Kensington lifestyle and an enthusiasm for eating well. As such it is excellent. Few food books are written to widen our understanding of food. Many are written to increase a sense of mystery and to deepen our sense of ignorance. Few recipe books are written with the intention that many people will actually follow the recipes. A recent Food Programme (BBC Radio 4) suggested that the average is just 2 dishes made from each recipe book bought. And this survey was carried out by people who write recipe books. Gordon Ramsay has discovered (correctly) that turning the steak often will get the heat through to the centre of the steak more quickly and will distribute the heat more evenly. Laboratory tests based on computer predictions show that turning the steak every fifteen seconds will give you a more perfectly cooked viand. He’s so carried away with this idea that he overlooks the importance of searing the steak in the pan first. He makes up for this by telling you the type of pan to use (non-stick), that you add oil to the pan first (debatable) and then add more as it cooks along with a pat of butter, and that you can add flavour by adding some slightly crushed garlic cloves and a sprig of thyme to the pan during cooking. Now searing the meat is the contentious bit. Until the 1970s this was essential and we all knew why. It was to seal the steak and prevent juices from escaping thereby guaranteeing a juicy steak. This was about the only bit of culinary science my mother passed on apart from knowing that liver and watercress both contained lots of iron and bananas were good for you because they contain potassium and we all know how and why potassium is so important for us. Don’t we? His 1984 book On Food and Cooking: The Science and Lore of the Kitchen has become one of the most influential books on food of recent times. Heston Blumenthal cites it as the turning point in turning him into a cook and the main reason he became the sort of cook he turned into; an inventive one who is as mindful of the science as of the supposed art of the kitchen. Until ten years ago many cooks would have found a reason to switch off after a single sentence. How could someone using words like sarcoplasmic and structural components have anything to add to the mysterious art of cooking? The next thing you know they’ll be trying to explain colour in paintings and pointing out the links between music and mathematics! Hervé This is also very good at explaining why the searing of the meat adds so much to the final flavour of the steak. I’m not a scientist but I am a huge fan of science in the same way as some very fine scientists of my own personal acquaintance can, and do, have an impressive appreciation of music and literature. The science informs my cooking and adds to the pleasure in both the process and the product. I’ll hand over to the scientist again to give a potted explanation of what scientists refer to as a Maillard Reaction. Maillard reactions are what is happening to the surface of the meat as it is seared, it explains both the delightful smell of cooking steak and the fabulous final taste. It doesn’t stop there. But that will do for now. I’ve read a lot of books about food and I’ve read (for someone who has made a living out of his knowledge of poetry and drama) a lot of science books. Recently I’ve read McGee’s On Food and Cooking and This’s Molecular Gastronomy. I may have to read them a little more slowly than a practicing scientist and I certainly have to re-read them more than I need to re-read most novels (though not most poetry which also, like the science, comes to life in terms of giving up its meaning through careful re-reading). These are superb books that will have a lasting influence on the way I cook and my understanding of what is happening when I do. To celebrate I declared this to be steak week and I spent an hour every evening in practical investigations of Maillard Reactions. On Monday we had Ostrich steaks, on Tuesday Breast of Muscovy Duck and on Wednesday we had Rib eye steaks from a supermarket. The work will continue. In the fridge as I write are two very large T-Bone (Porterhouse) steaks from the Welbeck Estate. It has been a wonderful week. Oh, and there were a few non steak meals. As I was at the Welbeck shop it seemed a pity not to get a wood pigeon and give it a quick roast. It went down rather well with the leftover baked potato and cauliflower cheese from the day before. The bird cost less than a Starbucks coffee and cooked in 20 minutes. 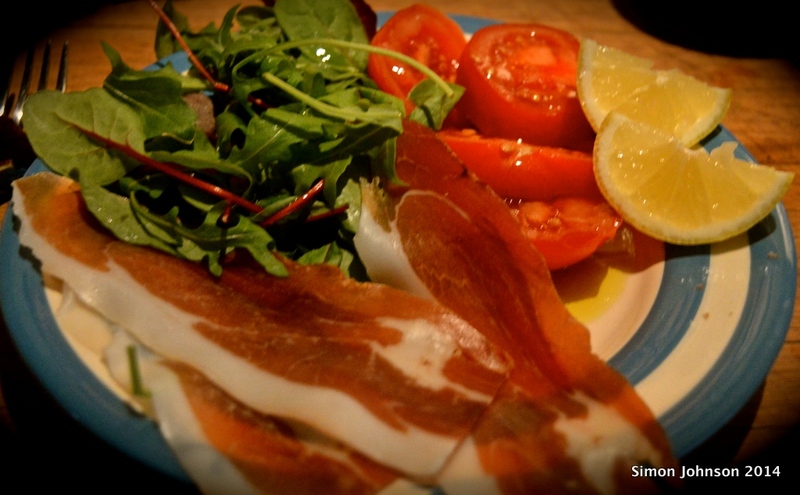 Cumbrian air dried ham from the Chatsworth farm shop. with a light salad. 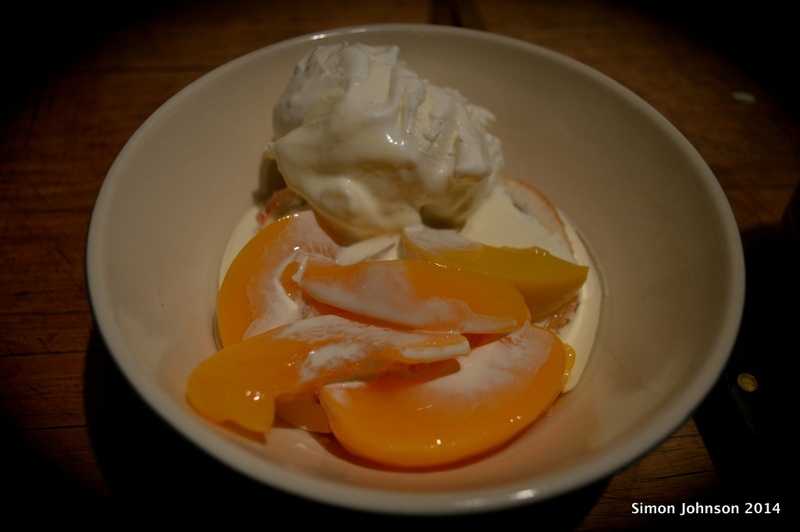 Cling peaches and vanilla ice-cream. The ice cream was from Chatsworth. It was very light, very white and rather free from taste. Cling peaches are always lovely. I’ve tried this before. I didn’t like it at all. This time I didn’t dislike it as much. Maybe I’d like it more if I spent a good part of the previous evening drinking port and malt whisky. It’s a rather unappetising green grey colour. The appearance and the taste go well together. Supermarket ham for a quick snack. 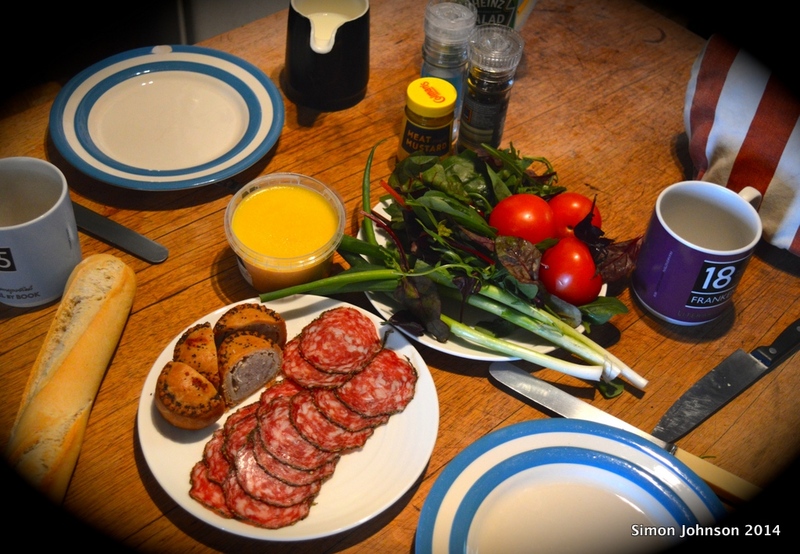 To balance out the meat eating of the evenings, breakfasts have been very frugal. This one was a pot of coffee by candlelight. 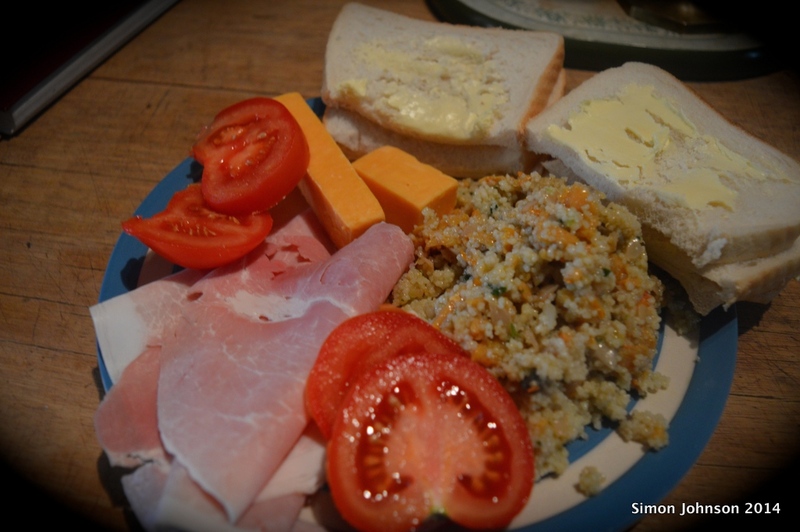 Not all breakfasts were quite as frugal. 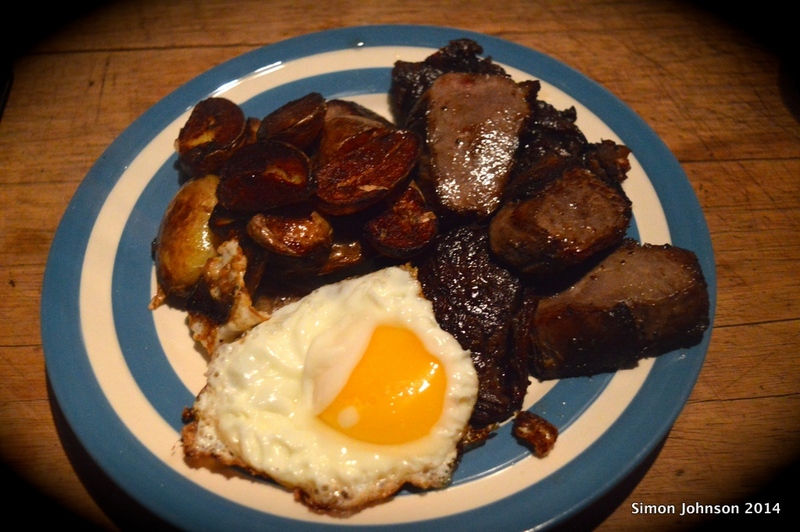 This one consisted of fried potatoes, egg and left over bits of steak and duck. I always fancied nineteenth century coaching inns would be a bit like this. Close readers may have noticed a lack of useful practical advice in this, but then, I’m with Nigella. We’d both happily admit to there being many, many people who know more about food than we do. But we’re right there, in the middle of the front row, when it comes to enjoying it. 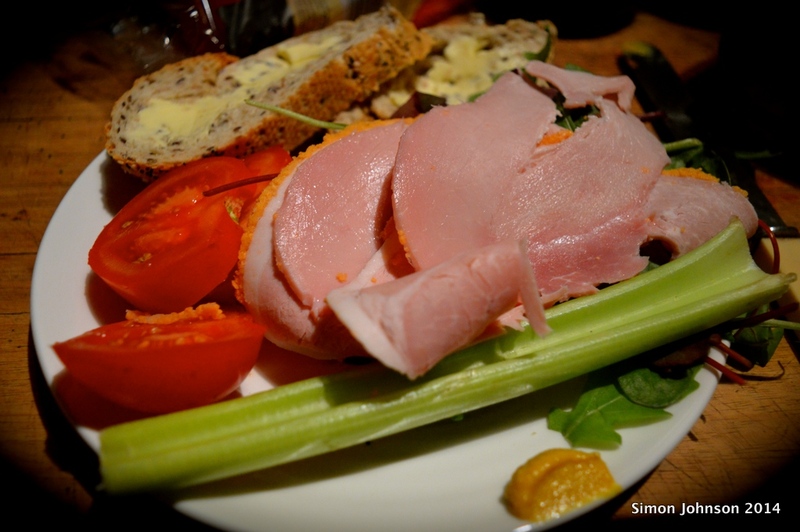 We kept October meat free but got very tempted by some Cumbrian air dried ham on a visit to the farm shop at Chatsworth. November has been an occasional meat month. It has been a brilliant month for smoked fish. We tried at least three sorts of salmon patés (two with smoked salmon and one with poached salmon) and then started doing a little bit of cooking ourselves. An Arbroath smokie became a highly flavoured risotto before an equally delicious Cullen Skink. 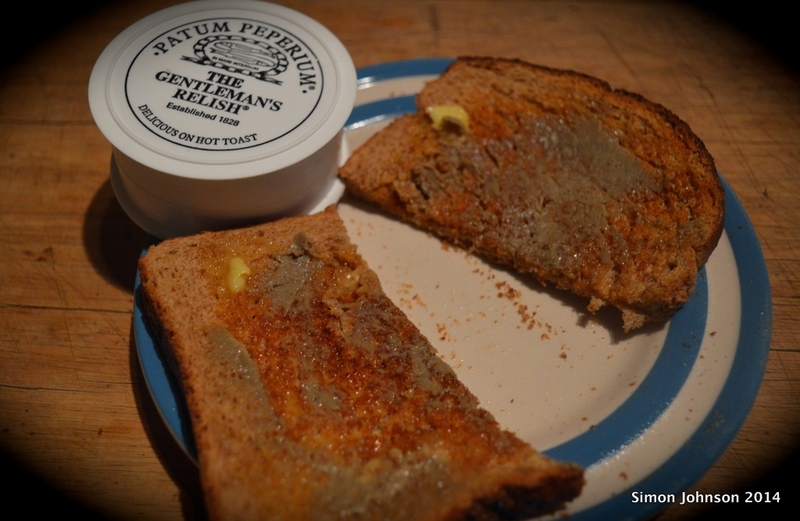 The highlight came with a pair of kippers that I reckon may be as good as those you get from Fortunes of Whitby. These were smoked in Argyll by the Inverawe company. They simply smelt and tasted as though they had just come out of the smoke house. The meat fell off the bones and Stewart (the cat), who is a laid back sort of fellow most of the time, became more animated than I can ever remember seeing him. 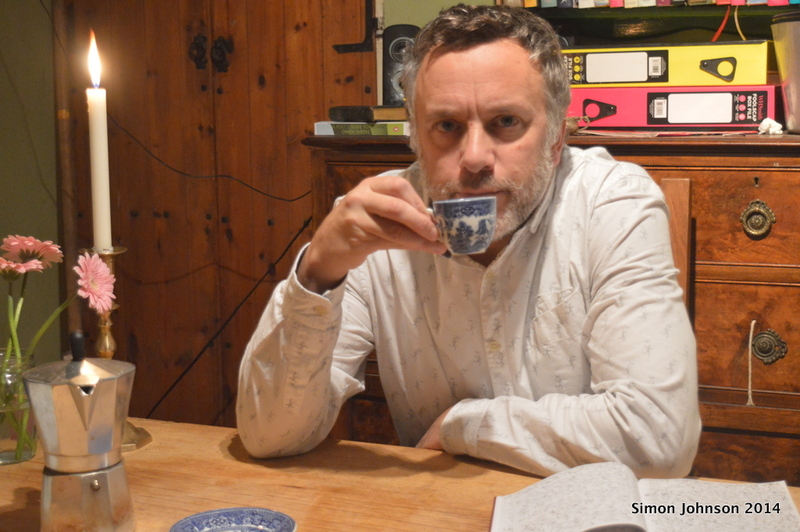 I wouldn’t say for certain that they are better than Fortunes but they are certainly up there; certainly a kipper worthy of the table for high-tea as well as breakfast. 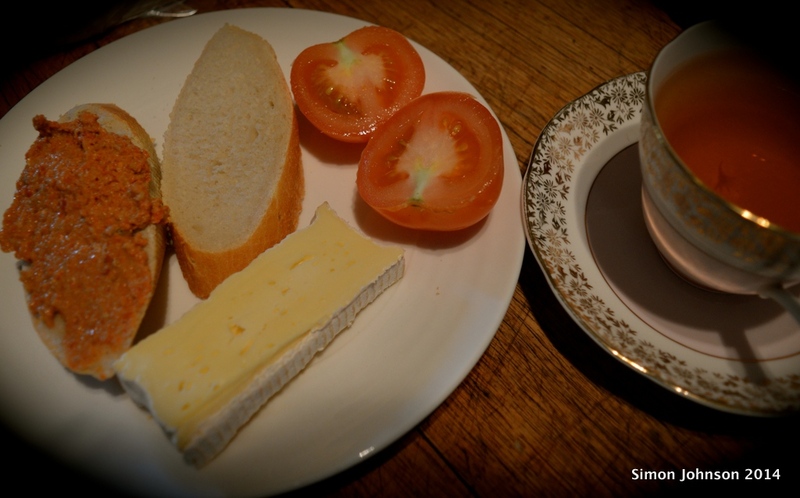 My favourite meal; some decent bread and cheese, paté and fresh tomatoes all washed down with a clean cup of tea. I can’t remember the name of the cheese or the paté. Both were bought at Waitrose and both went down very nicely. I wan’t intending doing a food blog so I didn’t keep notes. The tea is Betty’s Blue tea. It compliments this sort of a meal. If I see the cheese again I will buy it. Cheese is one of our greatest achievements as a species. 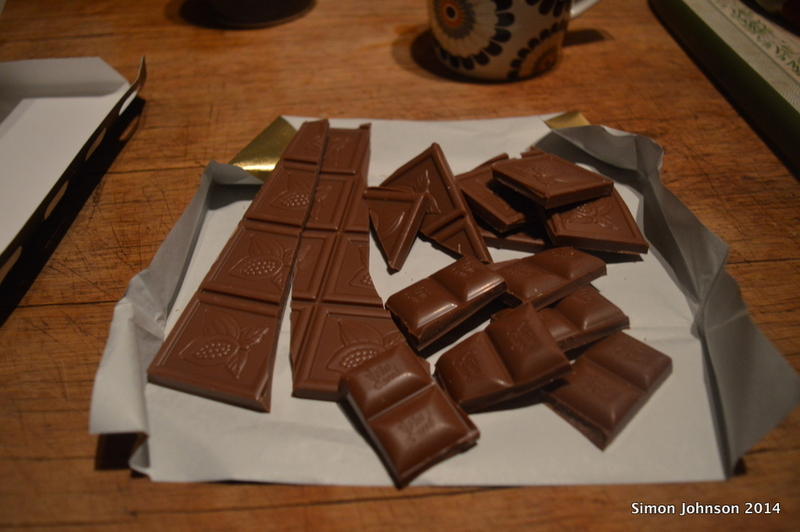 To be able to get so many different tastes and flavours and aromas into one foodstuff is something to be celebrated. Of course the human species has also, in Dairylea, been able to create a cheese that is almost free of flavour. It’s a decent starting point but a pity if it is also a finishing post. 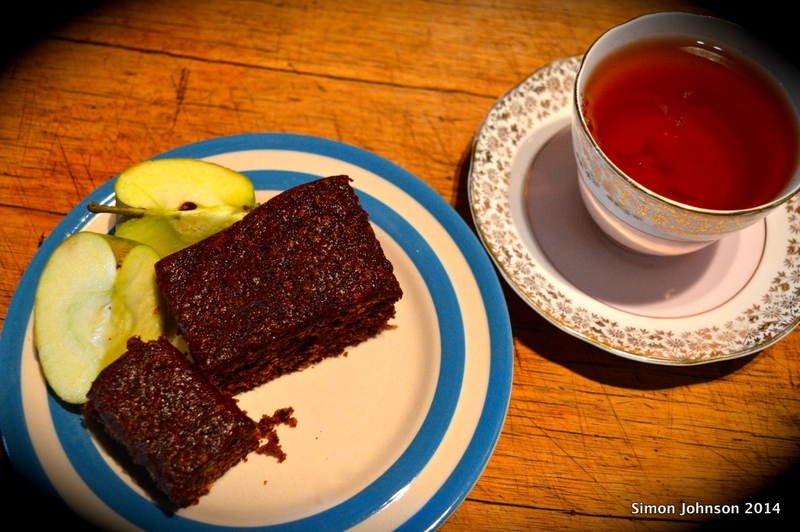 More blue tea with parkin and apples. Tastes of Autumn. 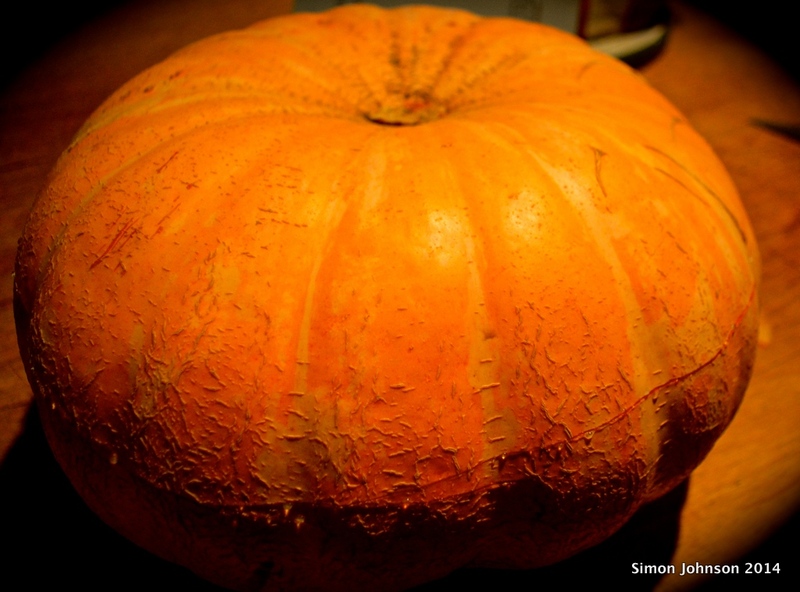 I did actually make a jack’o’lantern out of this (grown by Steven) but not until I’d made a gently spiced soup and a sweet pie to celebrate Halloween. The spice mix for the soup was cumin, coriander and fenugreek. It was wonderfully warming after spending the morning putting up a fence. The star here is hidden under a layer of melted butter. Again I cannot remember the name of the firm who made this salmon paté but it was exceptional. 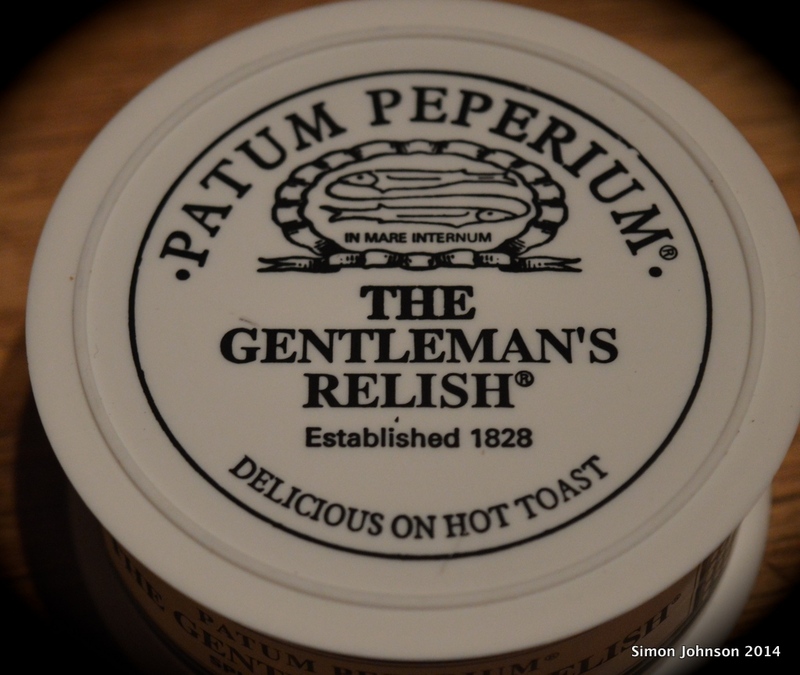 It was bought in Waitrose and I will be looking out for it in future. The best of all the ready made fish products we’ve had this year. One of the best ways of looking forward to Christmas is to spend a month or two enjoying the pleasures of simple, one food, meals. 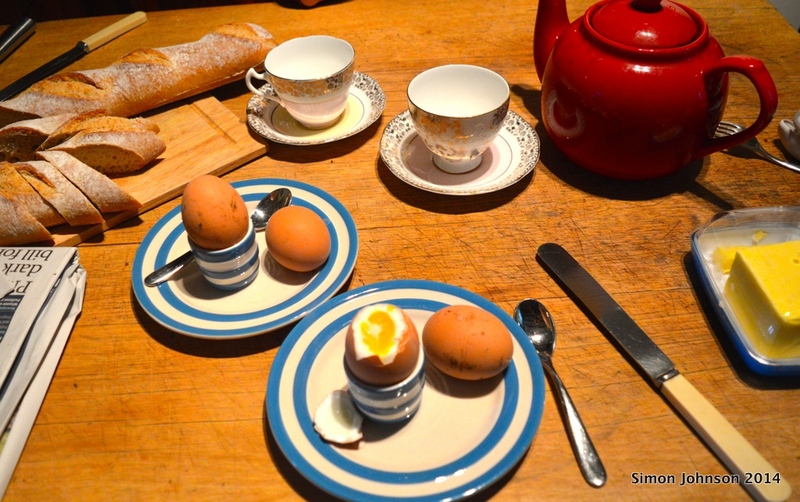 If you have a daughter whose chickens can provide you with eggs as good as these then you have no reason to be unhappy….we are extremely happy. 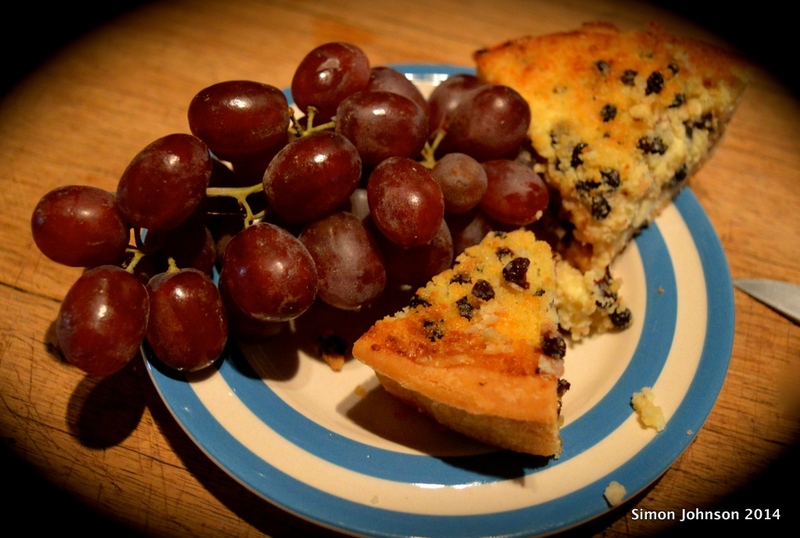 The Yorkshire curd tart (Not one for Dr. Spooner) was a little dry but this was taken care of by having it with a generous bunch of grapes. According to local legend (and Wikipedia) Arbroath smokies were created when a fire in a salting shed over heated a number of barrels of haddock that were being cured. It burnt down the building but left a culinary gem behind. I love Arbroath Smokies. They are young haddock that are first cured in salt, then air dried before being hot smoked in barrel-like-smokers. This is a big flavoured fish. The haddock isn’t without flavour in itself but all three of the processes add flavour and aromas that make these rather special. This is Cullen Skink. 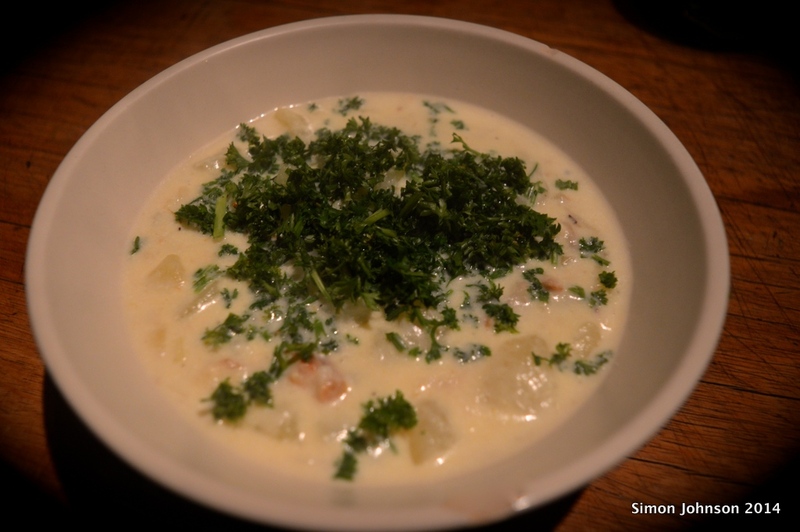 It’s a wonderful soup made from onion, potato, smoked haddock, milk, cream, parsley and seasoning. Scotland has got a very well deserved reputation for poor diet. If you really wanted to eat badly then Scotland will provide you with plenty of opportunities. It has also given us some of the finest of foods. Cullen Skink is a tremendous soup and all the better for being made with a genuine Arbroath Smokie. This simple risotto is also made from an Arbroath Smokie. The salt house fire is a myth. The people of the East Coast of Britain learned about preserving fish from Denmark and Norway. We owe a great deal of our culture to those who came from elsewhere to make Britain their home (long may this continue). Salt fish, dried fish and particularly smoked fish are a legacy from the vikings. Even accounting for all the middle class people who have started their own smokeries, the vast majority of fish smoking is still done in areas that were once ruled by Danes and Norwegians. The original “red herrings” came from Yarmouth. These were left un-gutted, saturated with salt and then smoked for several weeks. Apparantly they tasted wonderful and lasted for well over a year. The down side was an odour that has left them as a by-word for covering over a scent trail. Smoking began as a means of preserving fish but soon became a way of imparting a range of complex flavours (I’m largely paraphrasing sections of Harold McGee’s Food and Cooking here). Flavours used to be much stronger because fish had to be able to last longer. The link between food and industry is not always smiled upon but it was one of the main inventions of the industrial revolution that transformed smoking and curing. The steam engine led to railways which in turn allowed food to reach the plate days quicker and both salt and smoke cures became much milder. Arbroath Smokies are first salted which not only adds a little salt (a flavour enhancer) to the meat but also draws some proteins to the surface. When this is dried it forms a sticky layer that gives the fish an attractive gleam once it has been smoked. I was first attracted to smoked fish by the way they looked. There is an awful lot of pleasure to be had from food of this quality and good food feeds all five senses. Fish are either hot smoked or cold smoked. 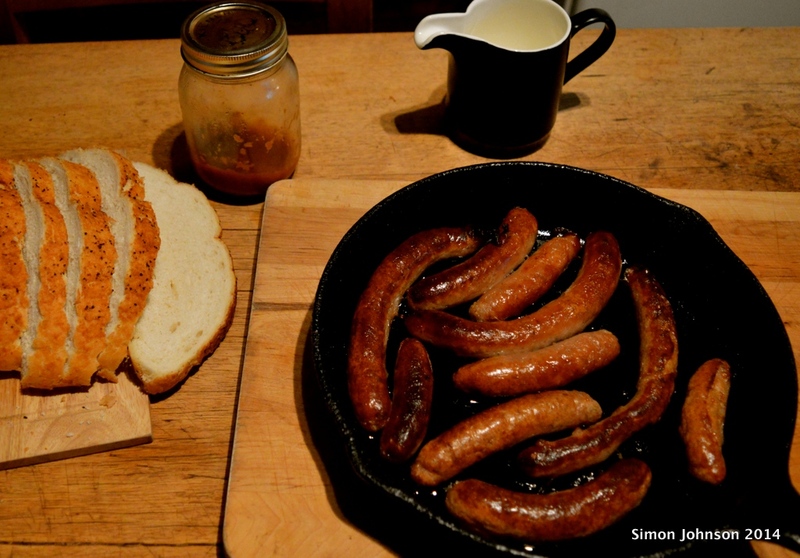 Smokies get the first treatment, kippers get the second. The other difference is that one is a haddock and the kipper is a herring. For centuries the herring has been a great food of the poor all around the coast of Britain. I like herrings in all sorts of ways but this is my favourite. At one time the kipper (like the sausage) was becoming a factory produced apology of its former self. Large food companies turned out pre-packed kippers by the score. Happily a few of the traditional smokers kept going and enough people insisted on the real thing. Now it isn’t difficult to get first class kippers in different parts of the country. If I was presented with a kipper that looked (and tasted) like the one above in an hotel I would go back again and again. If I got presented with a pre-packed, de-boned imitation I would be looking to check out as soon as possible.